Heard of SAPTCO? Need to know what it is and how to avail its services? Well, you are at the right place. 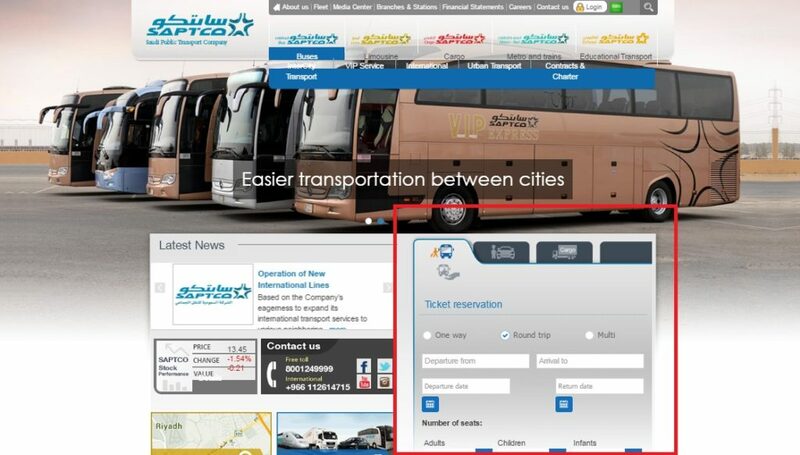 SAPTCO is a Saudi Arabia Public Transport Company which is providing a reliable and easy bus service. The ones who have traveled through SAPTCO rate it as a good, comfortable and high-quality service. Unlike the common bus services, SAPTCO is timely, speedy and facilitates users through online booking. That is how easy it is now to book your seat in SAPTCO! 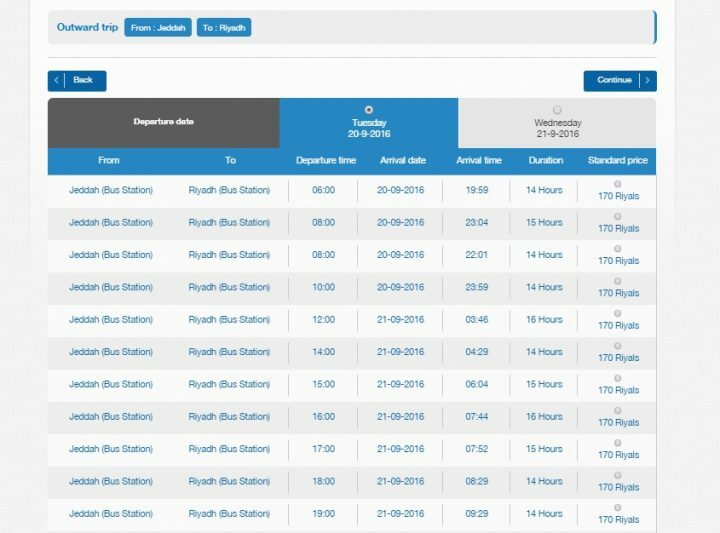 So here we will be providing you a step by step guide for online booking of SAPTCO: a modern bus service experience worth having! 1-The first and foremost thing is to open up the website for the online booking. Visit the service website (https://saptco.com.sa/). Having a problem with language? Well SAPTCO can facilitate you in different languages. In order to change the language to English click the icon (which is made prominent in the picture below) and enjoy the entire content in English! 2-Now you have to fill in the ticket reservation dialogue box. This is the main step. The box has been highlighted for your ease. Fill it in according to your needs. To make things simple for you, we have filled a box, as a sample. The picture below guides you how to fill it. Once you have filled in the requirements, you need to tap the search button. 3-By clicking on the search button a new page will be opened up for you, which shall be similar to the picture below. Select the departure time that suits you! Once done with it, you need to click the “Continue” tab which is just below the page. 4-Once you click the Continue tab, you will go to a page in which you have to provide the necessary Passenger information. The page shall look like the one given below through a screenshot. The picture has been provided for your ease! 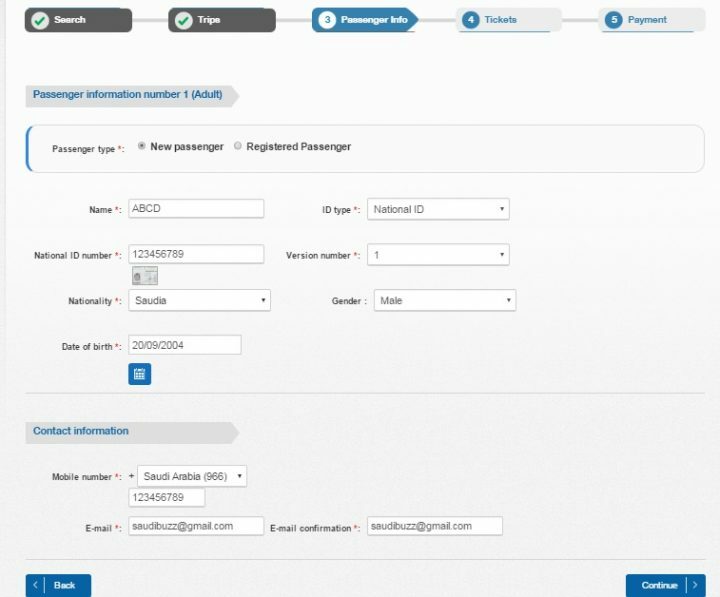 After you are done with filling in the required passenger information you are to click on the continue button. This way your ticket will be confirmed! That’s it! That is how easily you can book a ticket of SAPTCO while remaining at home, office or any other place! Do enjoy the speedy, easy, comfortable and highly reliable SAPTCO services!